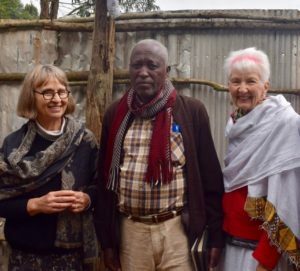 News from Caroline Kurtz, who is back from Ethiopia and back to work! Ethiopian friends later told me, “Stick with national food. Restaurants hold the foreigner-food too long because no one orders it.” In fact, I was fine all through the time down country, eating in hole-in-the-wall local “food houses!” It seems like a good metaphor for my work–stick with local wisdom, don’t try to import too much of a US sensibility for schedules, contracts, or expectations. The cure for giardia is like magic–swallow four pills and you’re back to health. No gradual recovery, no taking it easy . . . bing, bang, boom, it’s over! The only difficulty left was catching up from being gone and then sick for a week upon my return. But it’s wonderful how time passes, things get done one by one . . . now, bing, bang, boom, I’m caught up. What were the highlights of my time in Ethiopia? 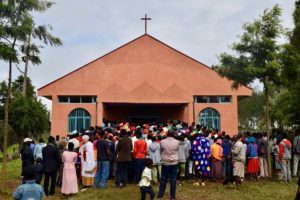 First, the dedication of a beautiful church building in Maji–the Harold Kurtz Memorial Church. Funds from Dad’s memorial got the project started, and local volunteer labor and contributions brought it to reality. Special thanks to Presbyterian partners Mike and Kelly, who filled in the gap between the two. The church is the most beautiful building Maji town has ever seen–the whitewash of missionary days and the garish colors of paint from the Communist era . . . gone! Beautiful paint colors are now available and were used with great panache. I stayed on to meet with local government leaders; church leaders at the presbytery and synod levels; my Ethiopian solar provider; an Ethiopian lawyer, who is registering my nonprofit as an Ethiopian charity organization; and friends. Now I’m preparing to return on September 10th for a fall launch. I’ll keep you posted! Thank you for joining me and making this project possible. We gathered outside the church until it was blessed, then poured in, with sparklers, clapping, singing and the joy-cry. Dorothy Hanson Russell’s (right) parents started the Presbyterian work in Maji in 1947. Our family came to replace them in 1956. Getachew (center) was at the Maji school, and earned money for school working on the mission compound when I was a girl. What a sweet reunion for the three of us! I had a long, encouraging meeting with leaders of Maji District. The administrator, wants to investigate cost sharing with my nonprofit. 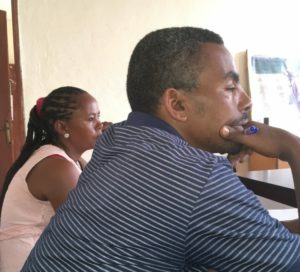 Abinet (right) is the head of the energy and resource department, and Fatuma (left) is in charge of women’s and children’s issues. Everyone is excited to collaborate. Samson (above) and his partner are Ethiopian businessmen specializing in solar energy. Their parent company is in Germany. 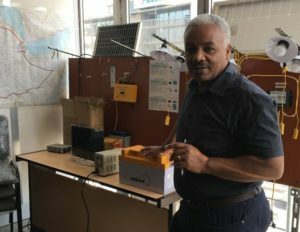 I have just signed a contract with them to buy and import the first 250 solar home systems (panel, battery, phone charging, three lights and radio).